The Canadian mid-west is so flat that farmers joke that they can see their dogs run away for two days. 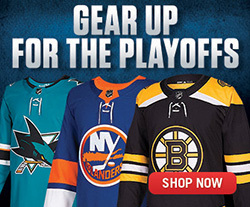 But it's the heartland of the country, and the Stanley Cup was pleased to return there on August 18 with Shane Hnidy and on the 19th with Johnny Boychuk. Shane Hnidy met the Stanley Cup at the Winnipeg James Armstrong Richardson International Airport, and then drove to the home he shares with his wife Michaela. There, a professional photographer took portraits with Lord Stanley's Cup. Packed and ready, Shane and Michaela drove to his parents' home in Neepawa, Manitoba. A beautiful farming community, Neepawa is known as the 'Most Beautiful Town in Manitoba,' certainly, in part, because of its annual lily festival. Greeted by his father, Ed, and Mom, Diane, Shane carried the Stanley Cup into the backyard where a few friends were waiting to see the Stanley Cup. 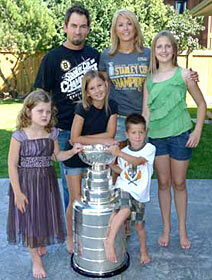 That afternoon, Shane took the Cup over to the Yellowhead Centre, where he played hockey as a youngster. Fans from near and far gathered to meet Hnidy and get a picture with the Stanley Cup. One fan made an eight-hour drive to see the most famous trophy in sports! and guests at the Yellowhead Centre in Neepawa, MB. 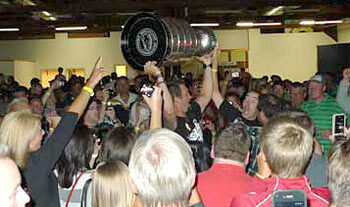 In the evening, the Stanley Cup was the guest of honour at a social at the Yellowhead Centre. More than 500 fans bought tickets to dance, have a drink or two and to see Shane and his Cup. 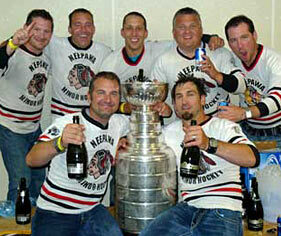 While the party raged on, Shane snuck away with his brother and a few buddies to sit in the old dressing room and sip champagne from the Stanley Cup, reliving memories of their years in minor hockey. The night wound down back at the home of Shane's parents where close friends sat in the garage with the Stanley Cup, reliving Hnidy's 550-game NHL career that saw him play with the Ottawa Senators, Nashville Predators, Atlanta Thrashers, Anaheim Ducks, Boston Bruins and Minnesota Wild before returning to the Bruins in 2010-11. It was a special moment, and made all the more poignant when, on August 31, Shane announced his retirement from active duty. 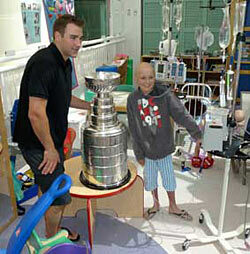 Johnny Boychuk and Lord Stanley spent some time at the Stollery Children's Hospital in Edmonton, AB. Johnny Boychuk turned out to pick up the Stanley Cup at Edmonton International Airport on August 19. Along with new bride, Sheena, his Mom, Audrey, and Dad, Johnny Sr., as well as brothers Sam and Dave (not the recording group), the family stopped for lunch at Chop Steakhouse and Bar. Next, they spent an hour or so at the Stollery Children's Hospital, brightening the day of young hockey fans and their families. The Cup was taken to Johnny's parents' house. Placed in the backyard, it became the focal point for some wonderful photos. Then, the group heard a car in the driveway. They gasped! It was a 1952 Astin Martin, customized to honour the Boston Bruins. The paintjob was magnificent in Bruin back and gold. The black leather seats featured a bruin on the headrest. The chrome on the glove compartment was engraved with Bobby Orr's signature. Bobby had also signed the outside paintjob. The car's owner, Al Peterson, owns a car dealership in nearby Sherwood Park, and there is no doubt with whom his allegiance lies! 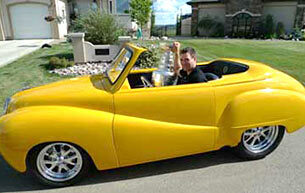 Johnny had a number of pictures taken with Peterson's pride and joy. getting some photos with a 1952 Astin Martin. Boychuk took the Cup over to Rexall Place, and held Lord Stanley's legacy aloft beside the bronze trophy of Wayne Gretzky in a strikingly similar pose. Outside United Cycle, there was a gigantic Stanley Cup on display, so Johnny pulled over and had pictures taken with the real deal and the pretender. The Pipes and Drums of Edmonton Transit led Johnny and the Stanley Cup into Fort Edmonton Park, the largest living history museum by area in all of Canada. The park includes both original and rebuilt historical structures representing the history of Edmonton. 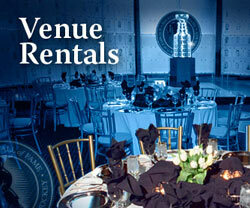 While the park was conceived in 1915, Lord Stanley's venerable trophy pre-dates it by 23 years. 500 fans waited for Boychuk's arrival with the Cup, and Johnny spent several hours signing autographs and posing for pictures. Johnny's day with the Cup concluded at the Cook County Saloon, one of the best country music clubs in the Edmonton area. While some danced and others raised a glass to the Bruins' accomplishment, Johnny allowed the public to see the Stanley Cup up close and personal. The Stanley Cup Journal returns on Friday from Atlantic Canada, hitting three provinces in three days in the process of visiting Adam McQuaid, Brad Marchand and Michael Ryder.